After having saved up for more than two years the meager monthly astronomical budget allowed by my wife, I finally found myself getting close to having enough money to get one of the variants of the 16200 sensor that I've had my eye on to take better advantage of the huge image circle of my Tak FSQ-106N than the Nikon D5500 I am currently imaging with. The variant I had particularly in mind was the QHY 16200A, it seemed the best bang for the buck. Then, just recently along comes QHY and ZWO with two color cameras based on the full-frame Sony IMX128 and and IMX094 sensors to throw me all in a tizzy!! QHY has the 367C (the IMX094) for $4400, and the 128C on sale for $3000 at the moment. The QHY16200A, by comparison, is $4000 plus filters, but also looks to be an amazing camera. So now I'm stuck in a quandary. I know the whole OSC vs. mono thing has been done to death and is my personal choice, but regarding the two OSC cameras: I am unsure of the pros and cons of the IMX094 vs. IMX128. The IMX094 chip has a higher resolution (36MP) and a pixel size which I think is a bit better mated to the FSDQ106 than the IMX128 sensor, but on the other hand the 128 has a larger well depth. That special offer for $3000 is also a consideration for sure. I need to make up my mind before the end of the year, at which point QHY's introductory price for the 128C ends. I am leaning towards the QHY128C, with its significantly lower cost than either the 16200, QHY367C, or either of the two ZWO offerings. And given the tradeoffs of price, resolution, and well depth, I think at the current price differential the 128C wins over the 367C/ASI094MC Pro. But I am definitely new to the CCD/CMOS dedicated astrocamera world and would appreciate comments regarding the pros and cons of the cameras I mentioned. I decided on the QHY16200 because I wanted something that would work when the moon was up for narrow band. I loved the color options but I just couldn't give up using my system on so many clear nights. If you aren't going to do narrow band then the color cameras would be a much more compelling option. I woud have a hard time in choosing in fact I would buy both a OSC and a Mono in an ideal world. While VDB's shots are impressive, and because i am a CMOS fan for price and low noise, and a mono fan for the reasons RR noted above, i think you should bank your money as i think the CMOS wave will probably get to full frame mono soon. Though it seems AP sensors are the hand-me-downs from other industries. Maybe contact ZWO and QHY and see if any FF mono sensors are planned. I just went through the exact same mental exercise. Same scope too.While the smaller pixels of the QHY367C are appealing, the added cost isn't. Plus, at least according to AstroFactors, it will not be available until spring. So, I just sprung for the 128C. It should arrive Thursday. The pixels are a bit larger than I would like for the FSQ106, but with the low noise and very deep well, I will be able to use many high-gain exposures with short duration and I'm sure that drizzling will be a standard part of my work flow. As for a mono version of a full-frame CMOS becoming available soon, I would not hold my breath. These are mass-produced DLSR sensors being re-purposed for a comparatively minuscule market. No sensor manufacturer is going to retool their process that produces sensors by the millions in order to serve a market consisting of thousands at the most. It is not a simple matter of skipping the bayer matrix application. Each layer is carefully engineered. The bayer layer is engineered to adhere to the sensor face and the microlens layer is engineered to adhere to the bayer matrix. It would take a fair amount of engineering cost and probably process modification to produce a sensor where the microlens layer is deposited directly to the sensor face. Not sure I see the point of a full frame sensor. You can get equal FOV by dropping focal length. The FF sensor gives you more resolution when printing and viewing the image. But I tell everyone in AP, do we need such high resolution? Everyone seems to be sacrificing SNR for resolution. How far in do we have to zoom? I think to maximize SNR use the least resolution that produces a good picture -- especially if viewing most of your images on a computer screen. My thoughts at the moment are to use the 4/3 mono CMOS sensor on the market now. To me, it was a simple calculation: 1. I like wide-field, and leaving any image circle/FOV on the table was to be avoided (if possible); 2. I live in a place where I can't image, so I MUST go to a darksite (once a month, if I'm lucky), so the new sensitive CMOS (had the 367C, loved it, just got the 128C, but haven't got it out yet: fires & weather) were great for maximizing my imaging AND work well for the few times I'd NB with them. 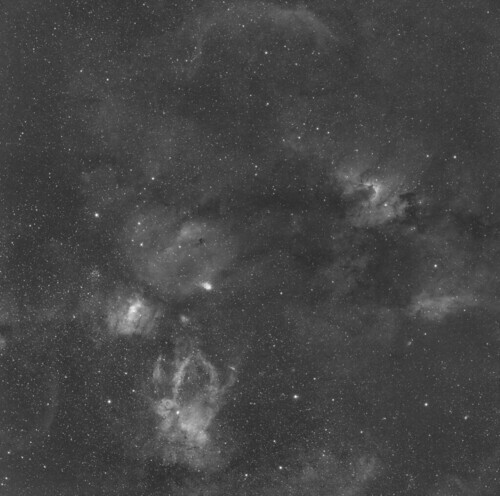 Now, if I had a backyard at my place in the middle of my horrible white zone, I'd get the mono CCD, as I'd be doing NB every clear night, thus maximizing my usage (and making the lesser FOV a less important factor). So: doing a lot of NB? Get the mono, smaller CCD chip. Getting to a darksite and doing less NB? Take the CMOS/bigger chips. At least that was my calculating. By the by, QHY is still experimenting with mono-modding their 367C camera, but it seems to be stalled at the moment (I'm supposed to beta test one, but haven't heard in a month). So, that's how I see it...for what it's worth. Edited by psandelle, 12 December 2017 - 10:33 AM. How do the various choices compare in H-alpha QE? I would want to compare them there for both color and narrowband imaging. My own choice would be a mono camera, perhaps a used one complete with filter wheel, filters, and adaptors from a high quality maker. They will last a long time and could easily give 10+ years of service. As will the FSQ. Edited by dsnope, 12 December 2017 - 12:04 PM. Dropping focal length is not a simple matter. It involves different equipment either in the form of a separate scope or a reducer. A separate scope is a substantial added expense, and a reducer, while cheaper, typically comes with a more aberrated field. With a scope like the Tak FSQ106, you get an extremely flat, sharp field that is fully illuminated across 88mm. My current camera (QHY 163M) only uses about 400 square mm of the available 6000 or so square mm of very nice field that this scope provides. The other 94% of the field is wasted. I want to use more of that field, so for me there is a very clear and obvious point to a full-frame sensor. Aside from the pure Hubble palette narrow band imaging or living in extreme light pollution, I think there is compelling images and data to show just how good these new CMOS OSC cameras are. That is my recommendation at least, I would go with the QHY128C, if I where in your situation. You can also get a LPS filter, and narrowband filters anyway with the OSC cameras. Tim, I always knew the Tak had a huge illuminated field but I have never done the very simple math that you just did. Even a full-frame sensor, 36mm x 24mm, at 860 square mm is capturing only 15% of what the FSQ106 could theoretically deliver. What a scope!!! And thanks everyone, your responses have all been very 'illuminating'! That is why I moved the Tak + 367C to a dark location. Now I wish I had installed the filter wheel with the move, need to get back there some day with filterwheel + Ha filter. Any insight into a full frame CMOS Mono sensor on the Horizon? I'm getting ready to retire and want to upgrade from my old ETX and web cam. All the newer scopes have such great image circles I hate to give up all that goodness with a small sensor. I'm fortunate to have a fairly dark back yard and am daydreaming about a slide off roof observatory for imaging and minor planet hunting. I'm far from being impressed by photos taken with the color cameras. 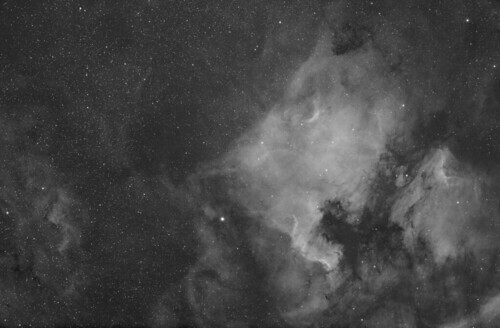 I would go for the 16200 for its ability to image in narrowband without compromises. I bought the Moravian G3 Mk2 with enhanced cooling. It is a fabulous camera with rock solid drivers and a very high quality build. It just works straight out of the box and produces fabulous results. I would recommend it to anybody looking for a 16200 camera. Seriously agree with this statement. Camera, wheel, OAG, in APS-H format, with great specs on it. Price is outstanding. The Moravian 16200 Mk2 is on my short list as well. If QHY can manage to get reliable drivers for the 16200A together, they are my other option at this tier. Ultimate for me would be FLI. I still hold out hope for a large format CMOS mono that even at the same price as the Moravian or QHY 16200 cameras, I would be inclined to go for based on the dramatically shorter subs potentially allowing pretty much unguided imaging on my setups.